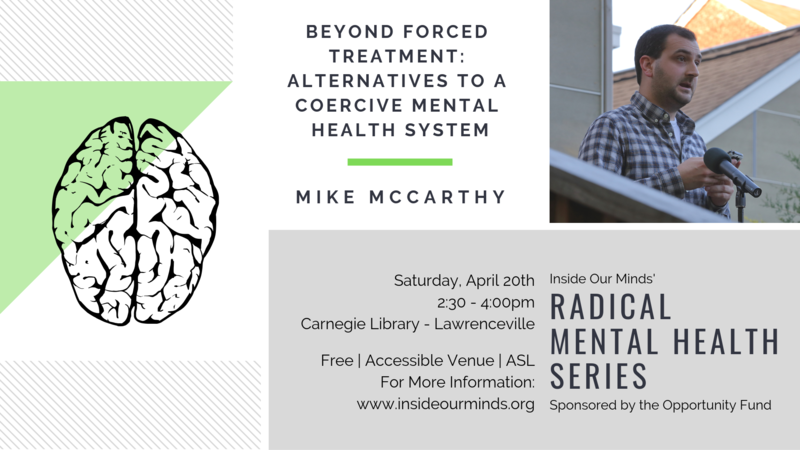 In this workshop, presenter Mike McCarthy will offer an opportunity for attendees to learn and ask questions about forced psychiatric treatment. Attendees will learn what constitutes forced treatment and how our system currently justifies its use. Mike will present legal and moral arguments against the use of forced treatment and discuss alternatives. There will be opportunities for attendees to ask questions and discuss their thoughts and/or experiences publicly or anonymously. Important Note: Forced treatment is a heavy topic and may be triggering to some. If you would like to see the slides in advance or ask questions about the content, please email our page. This space will operate as a safe space to ask questions, learn, and discuss from all viewpoints. This will not be a space for debate, shaming / fingerpointing, or discriminatory comments. This workshop is part of Inside Our Minds’ Radical Mental Health Series, sponsored by the Opportunity Fund. Learn more at www.insideourminds.org/radical-mental-health. Mike McCarthy worked in the mental health system for 7 years, but became disillusioned with a system that uses threats, coercion, and involuntary treatment to try to help people. Mike believes a better world is possible, but it will take a radical reorganization of power within the system. The Carnegie Library – Lawrenceville is accessible for wheelchair and mobility device users by a permanent ramp from the main building entrance. The downstairs auditorium can be reached by stairs or elevator. ASL interpretation will be provided during the workshop. There will also be earplugs and stim toys on hand for anyone who would like some. Please message the Inside Our Minds page with any additional questions. This program or event is neither sponsored nor endorsed by Carnegie Library of Pittsburgh.